Even though recent rains have brought some drought relief in the Northeast, 76% of the region is still in various states of drought that range from abnormally dry to extreme drought. The slides below show how the drought has affected 19 reservoirs in the Northeast. Imagery provided by the Landsat 8 and Landsat 5 satellites. 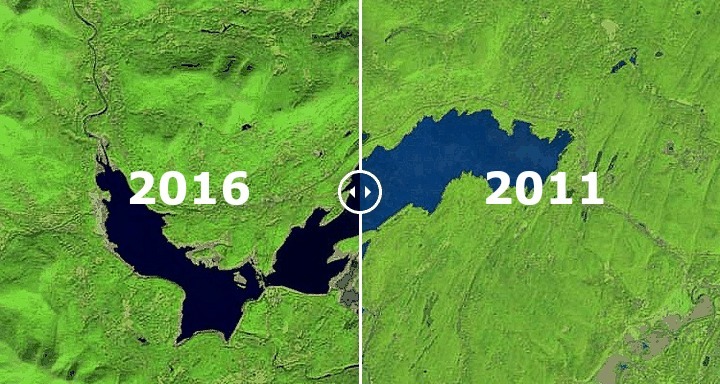 In order to minimize the effects of seasonal fluctuations in water levels, the “before” and “after” images are roughly around the same time of the year, no more than a month’s difference.Move the slider over each image to see the changes.